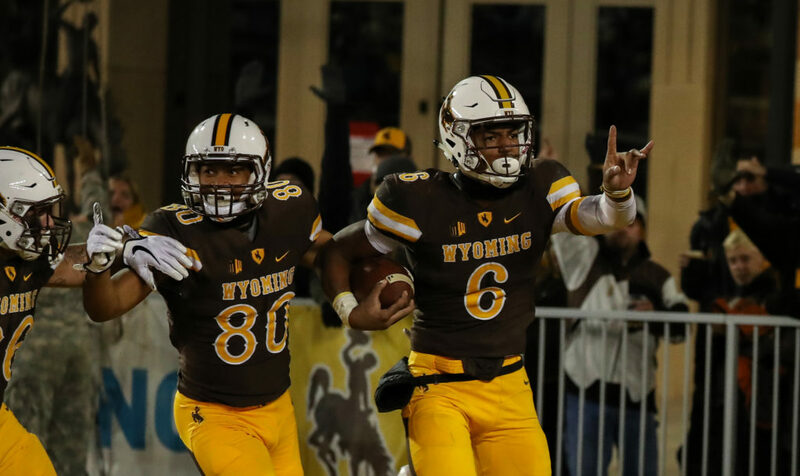 The Wyoming Cowboys kicked-off the first of fifteen spring football practices on Tuesday, marking the start of a 5th football season under head coach Craig Bohl. Josh Allen is headed to the NFL as a high draft pick and the Pokes have a QB competition on their hands (as we wrote about earlier in the week), but what non-QB UW position battles should you keep an eye on? Read on to find out! The Wyoming defense was quite the surprise last season with their massive improvement and part of what made the Pokes so strong was the stellar play of their two starting senior cornerbacks. Robert Priester and former JUCO transfer Rico Gafford weren’t flashy but got the job done more often than not. This tandem helped Wyoming to the #2 pass defense in the Mountain West allowing just 174.9 yards per game. Replacing these two will be no small task for Scottie Hazelton and company. The front-runners entering the spring to replace the departed seniors as starters were sophomore Braden Smith who played in 11 games last year backing up Robert Priester and Junior Tyler Hall who was the backup to Rico Gafford. Hall has been moved to the linebacker/nickel for spring ball, a spot filled by Jalen Ortiz and DJ May in the past few seasons. That should put redshirt junior Antonio Hull who missed most of last season with a quad injury (and received a medical redshirt) in the mix to be a starter. In his sophomore season, Hull was a playmaker who had 79 total tackles and 3 interceptions. If he can stay healthy and regain his form Hull could be the best corner in brown and gold this fall. The other players to keep an eye on who will battle for playing time with Smith and Hull include a few redshirt freshman in Keyon Blankenbaker and C.J. Coldon. The coaches are very high on the athleticism of these two young players and they really like the size of Coldon who stands at 6 feet and 1 inch tall. Blankenbaker and Coldon should see plenty of action in 2018 the question is how fast can the coaches get them ready to play at a high level? The Wyoming running game was absolutely atrocious last season. It was the worst running game production under Craig Bohl in Laramie with the Pokes rushing for just 108.7 yards per game which ranked 118th in the country. Wyoming returns their top four rushers at the position from last season and playing time at the position is up for grabs. Trey Woods who rushed for a team-leading 493 yards but with just 3.47 yards per carry, could see improvement after moving to the position from linebacker at midseason. Kellen Overstreet who looked the best late in the season and ran for 481 yards with 4.41 yards per carry could take a step forward as well. Both Milo Hall and Nico Evans offer the size and quickness to play the role of a third-down back if given an opportunity. Other players of note on the spring roster include sophomore Mike Green II and redshirt freshman Xazavian Valladay who could sneak their way into the conversation if the four running backs above fail to show improvement from last season. The RB position might be the most important to watch as the new starting QB will need a strong running game for Wyoming to play winning football in 2018. The Pokes had two solid wide receivers last year in Austin Conway ( 61 catches for 549 yards and 3 TDs) and CJ Johnson (30 catches for 531 yards and 7 TDs) but there was little production behind them. A third wide receiver who is a legitimate threat is a bonus in any system and the Cowboys certainly lacked such a receiving threat last season. Wyoming may need two guys to step up to join Conway as both CJ Johnson and John Okwoli suffered knee injuries in December and may not be healthy at the start of the 2018 season. Scholarship players from last season’s roster include senior James price who had 20 catches for 282 yards last season after suffering a broken collar bone. Avante’ Cox and Jared Scott both in their sophomore seasons could take significant steps forward this year. The wide receiver position is a tough one to adjust to from high school to college and wide receivers often make major jumps from year one to year two. With some playing time under both of their belts, the sophomore duo has a chance to add some more juice to the Wyoming offense in 2018. It should be noted that JUCO transfer Raghib Ismail Junior son of Raghib “Rocket” Ismail who starred at Notre Dame and played 9 years in the NFL is not on the spring roster. The junior rocket will make his way to Laramie this summer and will have to wait until fall camp to compete for playing time.